Chilly weather means frozen soil in many areas of the country. But just because the ground is solid, doesn’t mean water can’t seep in. It seems odd to water during the cold, blustery months, but winter plant loss of recent transplants (past year or two) is more often caused by lack of water than by freezing temperatures. When plants go dormant, they still need moisture. The biochemical processes that make plants cold-tolerant continue producing high concentrations of dissolved sugars and amino acids in the winter. They need water to do this. 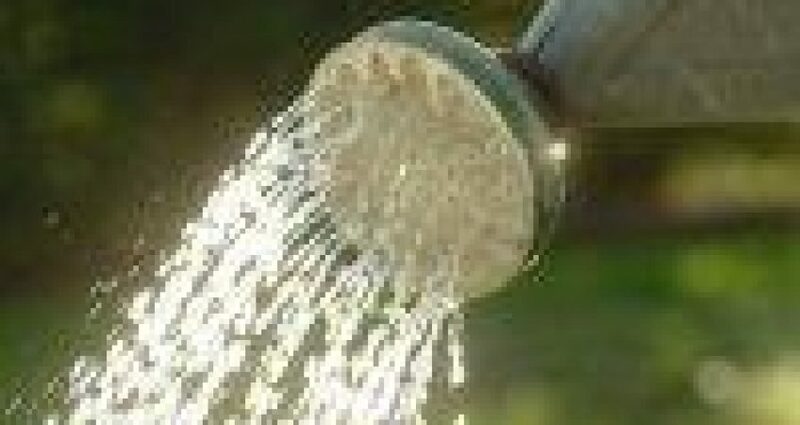 Depending on the amount of precipitation and severity of cold temperatures, a winter watering schedule may be needed. When the ground is covered with snow, watering usually isn’t necessary. Water once every 2-3 weeks through the winter if winter moisture are insufficient. In cold zones, water mid-day when day temperatures are well above freezing (45° F +) so the moisture can soak in before freezing again at night. Keep bulb areas well moistened. Though soil is solid, water still permeates. When watering and you hear ice crystals dissolving, it means the water is soaking in. Dissolving ice often helps aerate the ground. Poke your finger into the soil. When a half-inch of top soil is loose and beneath is frozen, that’s a good time to water. Avoid this problem by putting down a nice thick 2″ layer of mulch on the beds in fall after fertilizing. In full sun flower beds where moist soil repeatedly freezes and thaws, shallowly rooted plants will occasionally heave. Heaved plants can fracture taproots as well as lateral roots, sometimes resulting in elevated crowns that can quickly dry out a plant. When plants heave from the soil push them back in. Mulch generously to shade the soil, keep it frozen and prevent the freeze/thaw cycle. When the brutally cold weather hits, it’s ok to stay inside. But when there are hints of spring beginning in late January and early February, don gloves and hat, bear the wintry temperatures and give your plants a drink of water. It’s the surest way to keep a garden alive.